A black and white negative of a portrait of Stephen John Bragg. Stephen John Bragg (1918-2002) was the son of Stephen Bragg (1896-1927) who fought and was injured in the First World War. He was born at Toronto, Ontario on August 29, 1918 and move to Whitby circa 1920. For a number of years he lived in Oshawa, Ontario where he was a foreman at General Motors. Stephen (Bud) Bragg was President of the Royal Canadian Legion Branch 112, Whitby, in 1954. Mr. Bragg died at Oshawa, Ontario on July 20, 2002 and is buried in the Veteran's Plot at Thornton Cemetery, Oshawa, Ontario. 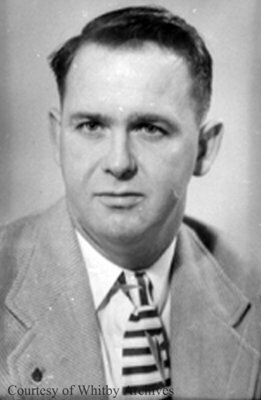 Stephen John Bragg, 1954, Photographer Unknown. Whitby Archives A2016_017_031A.